He addressed more than 1,000 Catholic lay leaders, clergy and religious from 52 parishes in all regions of the tri-county Archdiocese of Los Angeles gathered at the Pasadena Convention Center. Diocesan-level encuentros and regional encuentros are taking place around the country as part of a process of reflection and action leading up to the U.S. Catholic Church’s Fifth National Encuentro, or “V Encuentro,” to be held Sept. 20-23 in Grapevine, Texas. “Let us walk behind Jesus and take up our cross — following him and to bringing the people of our times to a new encounter with Jesus Christ and the mercy and love of God,” Archbishop Gomez told the crowd at the convention center. Angelus News, the archdiocesan news outlet, reported that throughout 2017, the archdiocesan chapter of “V Encuentro” sponsored consultation and evangelization workshops with parish leaders throughout the Los Angeles Archdiocese. Attendees at these sessions reflected on the encuentro process and discerned ways of becoming missionary disciples to strengthen the entire Catholic Church by serving all its members, especially the underserved. The Jan. 27 gathering offered an opportunity for archdiocesan delegates to reconvene and continue the consultation process until the April regional gathering in Visalia, California, and the “V Encuentro” in Grapevine. “The vision of ‘V Encuentro’ is to become more aware of God’s love in our lives and to share it with others, especially those most in need,” Ernesto Vega, coordinator of the archdiocesan encuentro, told Angelus News. During the day, participants shared testimonials of healing and conversion based on opportunities they have had during encuentro trainings to serve people in need. “For 50 years, the encuentro processes have contributed a strong pastoral and social justice agenda to the church in the United States, one that resonates perfectly with Pope Francis’ call for pastoral conversion and missionary discipleship,” he said. 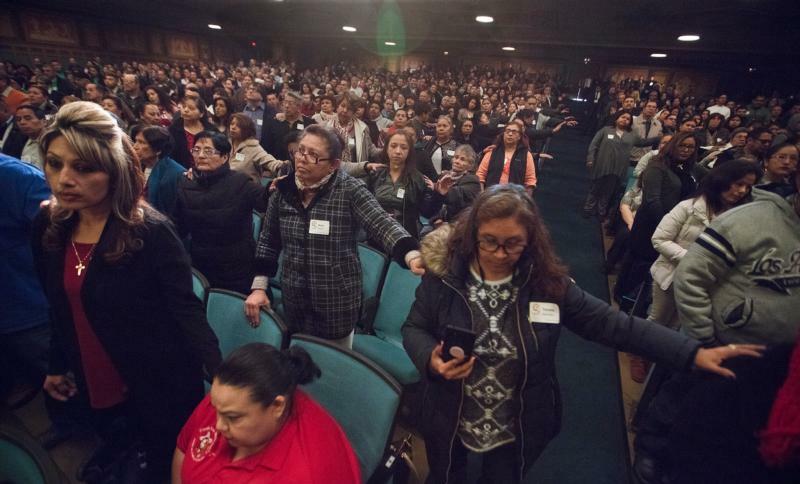 To date, more than 3,000 participants have finished the “V Encuentro” process at 65 parishes and ministries of the Archdiocese of Los Angeles. The training workshops have included themes such as family ministry in modern times, lifelong faith formation, accompanying the immigrant, current and emerging lay leadership formation, community outreach to the peripheries, access to education, priestly and religious vocations and young adult discernment, and models and methods of evangelization. “In its spirituality, theological vision and commitment to engagement with others, especially those on the margins, the ‘V Encuentro’ calls the entire church to proclaim the Gospel with creativity and energy suitable for meeting the immense challenges of today’s world,” said Father Figueroa Deck. Cecilia Gonzalez-Andrieu, a Loyola Marymount University theology professor, led a reflection session on the importance of “accompaniment” in being a missionary disciple. The session was based on a skit that she prepared and that was performed by children from St. Odilia Parish to show how people can overcome their fear of sharing God’s love with others. On Jan. 29, the U.S. Catholic Conference in Washington announced that delegate registration for the Fifth National Encuentro opens Feb. 20. In attendance will be 3,000 Hispanic/Latino ministry leaders/delegates from dioceses, ecclesial movements, schools, universities and Catholic organizations from across the country. The delegates will represent more than165 dioceses; they are being selected from among the nearly 250,000 people participating in the local process over the past year. Over 100 bishops are expected to lead diocesan delegations. “One of the most important outcomes of the (national) ‘V Encuentro’ is the discernment of priorities and recommendations that will guide Hispanic ministry in the United States for the next 10 to 15 years,” he said in a statement. Contributing to this story was the staff of Angelus News, the online news outlet of the Archdiocese of Los Angeles.